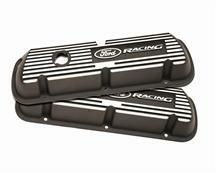 Are these taller than the stock valve covers so that they will accommodate 1.6 RRs? Will they fit under a GT40 intake manifold? For your application, we recommend using part number M6000J302R for fuel injected applications. These are designed to clear most roller rockers, but test fitting is recommended as in some cases, clearancing the bolt hole relief is required. Depending on the orientation of your throttle linkage, a 3/8s intake spacer might be required to clear.